I invite you to listen for two evidences how soundly Mingus worked in his early days. The first is the full texture he achieves with his own groups with no feeling on contrivance; just ahead of his time. The second demonstrates his abilities, not only as a sideman, but as a catalyser, fusing various types of music, the veterans and the new jazzmen. 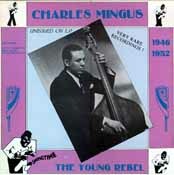 Charles Mingus, perhaps more than any other musician, personified the transition from bebop to a freer jazz style. 'Precognition' (5) and 'Portrait' (6) are also available on The Complete Debut Recordings and Debut Rarities Volume 4.